Days of Our Lives (DOOL) spoilers for October 2017 reveal the truth about why Sami Brady (Alison Sweeney) was in Europe. Prior to coming to Salem for the Will Horton (Chandler Massey) mystery, she was involved in another search. However, that wasn’t the end of the story. While in the morgue, Kristen DiMera (Eileen Davidson) injected a mysterious green substance into EJ’s body. What that substance was never revealed. However, Days of Our Lives spoilers tease it will come into play in the next several months. Following EJ’s death, Sami received a letter that was from the love of her life. He wrote that Stefano DiMera (Joseph Mascolo) was responsible. This led Sami to believe that her husband was alive somewhere. Alison Sweeney confirmed that Sami has been in Europe searching for EJ. With two dead Salemites reportedly alive, is it all tied together? With Stefano DiMera supposedly still alive and the diabolical Dr. Rolf (William Utay) returning, it must be connected. Dr. Rolf participated in some crazy schemes and let’s face it, resurrecting the dead is his specialty. 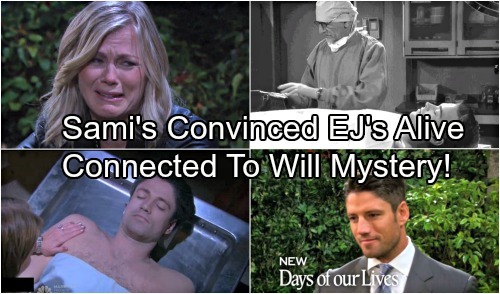 Days of Our Lives spoilers hint that Stefano and Dr. Rolf would have their reasons to bring EJ back from the dead. However, what about Will Horton? What possible reason would they have to involve Lucas Horton (Bryan Dattilo) and Sami Brady’s dead son in this experiment? Considering how John Black’s (Drake Hogestyn) resurrection “broke his brain,” there needs to be a test subject. Someone that Dr. Rolf can practice on to perfect his technique. Will might be that test subject. If this is accurate, what kind of damage will his brain endure? If and when Will is found, is there a chance that he won’t be the same man that everyone remembers?